I’m constantly amazed by the strength and variety of what the theatre offers us and how uncomfortable plays also test us, deeply. On two consecutive nights I recently saw really stirring, compelling productions of Andrew Bovell’s Things I Know to Be True (a returning show that I missed first time around at Lyric Hammersmith in 2016 and now back there ahead of a national tour) and Andrea Dunbar’s Rita, Sue and Bob Too (being revived at the Royal Court where it was originally premiered in 1982). They offer richly detailed, tough and tender portraits respectively of a deeply conflicted family (particularly in the parents’ treatment of their transsexual son) and grooming and teenage sexual awakenings. In the case of Rita, Sue and Bob Too, the on-off-on-again history of this revival became a big part of the current conversations around sexual harassment accusations, since its originally billed co-director Max Stafford-Clark was at the centre of them himself. In the Times, Libby Purves has noted that its cancellation and subsequent reinstatement is “a symptom of tricky times”. But the play itself should never have been silenced, and I’m glad that London has got the chance to see it again now. But it’s not only edgy work like this that needs celebrating. Last week, I also caught up belatedly with Agatha Christie’s Witness for the Prosecution, being staged in the atmospherically appropriate, courtroom-like council chamber of the former Greater London Council in County Hall on the South Bank. That took me to a venue I’ve never been to before, a treat in itself (as were the grand, cushioned chairs, complete with writing desk in front of each – a real boon for critics). But I was also entirely gripped by the play and Christie’s spectacular craft in maintaining tension and springing surprises. The place was packed, too. So there’s definitely an audience for this kind of immersive, site-specific theatre. We’ve all done it – the email gaffe where you mean to blind-copy people but don’t, and then reveal the names of everyone the email has gone to. But a stranger one occurred last week, when the press agent for the Bridge Theatre’s Julius Caesar sent a private communication, intended for director Nicholas Hytner regarding press seat allocations for the opening next week of that show, to a great swathe of arts journalists, critics and bloggers. Now, of course, we’re all dying to see who will be seated in AA or BB. That’s going to put some of us in our places, in every sense. 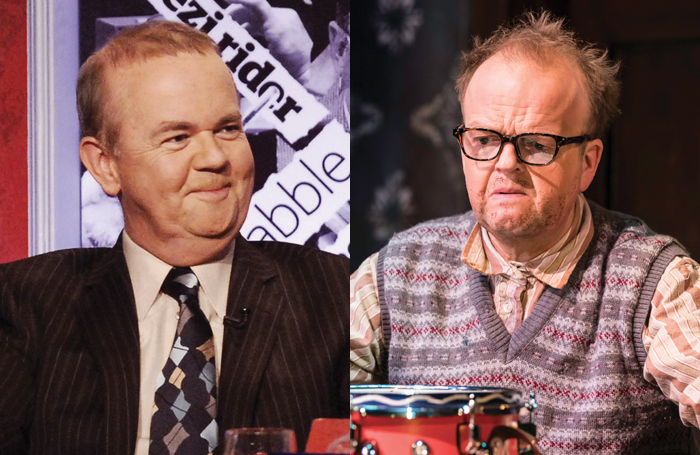 It was more than a little disconcerting to be watching Toby Jones (being utterly brilliant) in the revival of The Birthday Party at the Harold Pinter Theatre last week while his doppelganger Ian Hislop was sitting just a few rows in front of me. I just hope that Bob King, former creative director of Dewynters, doesn’t turn up at tonight’s opening of Dominic Dromgoole’s Classic Spring company show Lady Windermere’s Fan, or we’ll have trouble telling King and Dromgoole apart too. Do you have any other Theatreland doppelgangers?